Following our main mission in providing our customers with expanding capabilities in Atomic Force Microscopy (AFM) we have completed the development of a full set of oscillatory resonance modes. 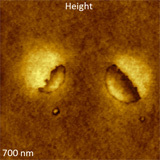 In addition to the well-established amplitude modulation mode with phase imaging (AM-PI) our microscopes are empowered with two additional modes: amplitude modulation with frequency imaging (AM-FI) and frequency modulation (FM). The creation of thes modes was made possible by a novel controller, which incorporates the broadband digital lock-in amplifiers and phase locked loop. From the Table below, which describes all three modes, one can see that in each mode two of three characteristics (amplitude and phase, frequency) of the oscillating probe are fixed and the third is detected together with the surface profile. 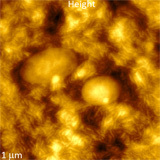 Therefore, in AM-PI mode the height and phase images are recorded. In AM-FI mode one obtains the height and frequency images; and in FM mode - the height and amplitude images. In AM-PI mode servo on amplitude at the resonant frequency of the non-interacting probe is used for topography tracking. In AM-FI mode the servo is on amplitude at the effective resonance frequency of the probe, which changes with the tip-sample interactions. In all three modes the additional images can be constructed from properties such as dissipation. From a theoretical view, variations of the probe amplitude, frequency and phase are related to the tip-sample forces, which reflect the samples properties through different relationships (models). We expect that phase, frequency and amplitude images recorded simultaneously with the height images reflect some common as well as specific features of the sample properties. Currently we are performing studies of various materials in all three modes and often with the additional use of the oscillatory non-resonant HybriD mode. An example of such studies is given below with the frequency image and elastic modulus map of a blend of polystyrene and low-density polyethylene. The correlation between the frequency shift and elastic modulus is obvious. More applications of AM-FI and FM modes were reported during the recent Webinar on May 28th, and will be presented in the upcoming application note. Please visit: http://www.ntmdt.com/webinars/archive to view the recording and download the pdf of the webinar presentation. Frequency image of polystyrene domains in matrix of low density polyethylene. The image was obtained in AM-FI mode. Elastic modulus map of polystyrene domains in matrix of low density polyethylene. The image was obtained in HybriD mode. From this discussion it is clear that the use of these techniques is far from trivial and that efficient imaging routines need to be worked out to get the reliable quantitative data. The general aspects of elastic modulus mapping in HybriD mode were presented in our application note and, currently, we are preparing the detailed operation instructions that cover the following topics: a rational determination of the optical sensitivity, an optimized choice of the probe for testing materials with different elastic modulus; and the peculiarities of elastic modulus mapping at the nanometer scale. An example of high-resolution modulus mapping of a blend of polystyrene and low density polyethylene is given above. We Can Do Vacations Too! Our hard-working researchers and engineers are completely devoted to developments of AFM instrumentation and applications. Still a short-term rest and change of environment might be useful for recharging our “batteries”. 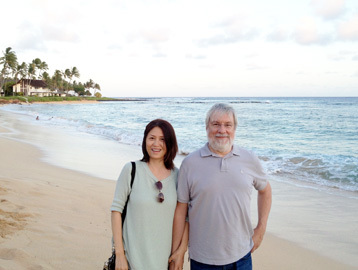 Our senior systems engineer John Alexander took a short break in May and spent few days with his family in Hawaii. The picture shows him and his wife Megan. On May 18 the NT-MDT Seminar “Expanding Atomic Force Microscopy Studies to Quantitative and High-Resolution Mapping of Local Mechanical and Electrical Properties” was conducted in Molecular Foundry of LBNL, Berkeley, CA. The seminar was attended by more than 40 researchers and brought a wide discussion of AFM application topics. On May 28 the NT-MDT Webinar “New Developments in AFM Oscillatory Resonance Modes: Frequency Imaging and Frequency Modulation” was broadcasted in the USA and Europe. "New Developments in AFM Oscillatory Resonance Modes: Frequency Imaging and Frequency Modulation" - on Wednesday, August 5th. In the scientific program on August 5th Marko Surtchev will give a talk entitled “High-Resolution Mapping of Quantitative Elastic Modulus of Polymers”. Height image of polystyrene domains in a matrix of low-density polyethylene. The image was obtained in frequency modulation mode. Height image of polystyrene domains in matrix of polybutadiene. The image was obtained in AM-PI mode.